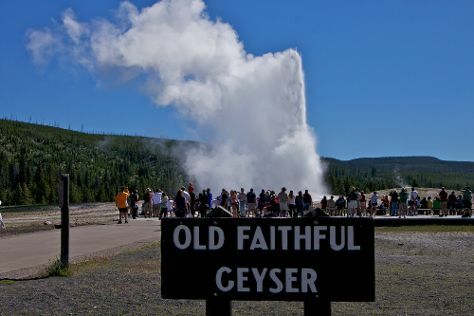 To find ratings, maps, photos, and other tourist information, use the Yellowstone National Park online day trip planner . Las Vegas to Yellowstone National Park is an approximately 7-hour combination of flight and car. You can also drive. The time zone changes from Pacific Standard Time to Mountain Standard Time, which is usually a 1 hour difference. Traveling from Las Vegas in May, expect Yellowstone National Park to be much colder, temps between 53°F and 27°F. Wrap up your sightseeing on the 1st (Sat) to allow time to travel to Santa Fe. Santa Fe continuously ranks among the world's top holiday destinations, attracting visitors with its unusual combination of scenic beauty, rich history, cultural diversity, and high concentration of performing arts venues, fine restaurants, and interesting attractions. Start off your visit on the 2nd (Sun): take in the architecture and atmosphere at The Cathedral Basilica of St. Francis of Assisi, then make a trip to Canyon Road, then make a trip to Santa Fe Plaza, and finally contemplate in the serene atmosphere at Loretto Chapel. For where to stay, other places to visit, ratings, and more tourist information, refer to the Santa Fe trip itinerary planning site . Traveling by combination of car and flight from Yellowstone National Park to Santa Fe takes 6.5 hours. Alternatively, you can do a combination of car, flight, and shuttle; or drive. Traveling from Yellowstone National Park in June, expect Santa Fe to be much hotter, temps between 89°F and 56°F. Wrap up your sightseeing on the 2nd (Sun) early enough to travel back home.